Today, we are making, Japanese bread rolls, in Japanese, Roll Pan. 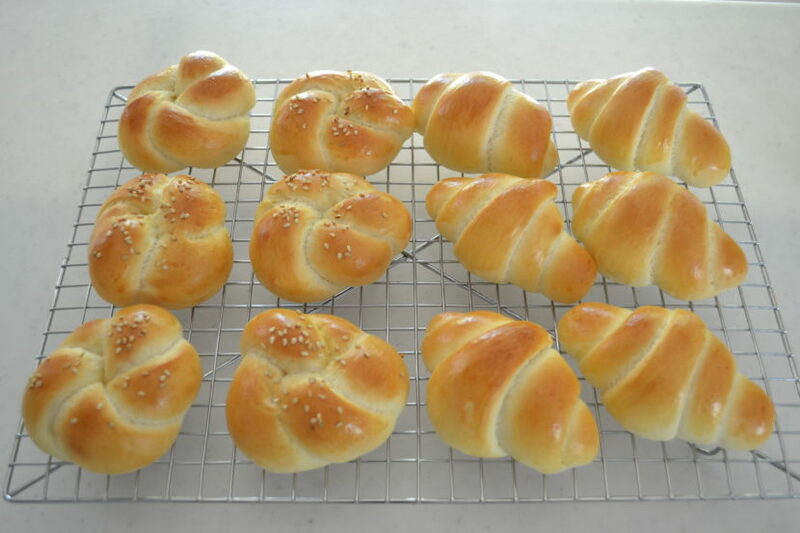 Bread rolls are very popular bread as well as Shokupan. The ratio is richer than Shokupan. We serve it with soups, making a sandwich, or eat as it is as a snack! Today I introduce you two ways of shaping. One is the old school, and one is a knot that looks like a flower. 1. Put your bread flour into a mixing bowl of a stand mixer. You can do it by your hand, in that case, make sure that your dough should look like mine. First, let’s prepare the wet ingredients. Add beaten egg into lukewarm water. Add milk and mix until well combined. Keep the rest of the egg for the later use. We will use it as egg wash.
2. While the mixer is running, add sugar, salt, and yeast. This type of yeast doesn’t require proofing, so it’s easy to handle. Run the mixer on low, until all the dry ingredients are mixed. Scrape down the side occasionally. Slowly add wet ingredients from the side. In this way, the wet ingredients distribute evenly and quickly. Knead the dough until very smooth for 5 to 6 minutes. After kneading, stretch dough with your fingers and it stretches paper thin almost see-through, it’s done. It shows us the gluten has developed properly. Add room temperature butter and mix until smooth. After adding butter, the dough will separate, but it comes together sooner or later. Take out the dough and check one more time. After adding the butter, the dough becomes more elastic and looks shiny. 4. Grease the mixing bowl with oil spray or vegetable oil. Take your dough back in. The dough should be shaped into a ball with a smooth surface. Cover with plastic, leave it at a warm place (30℃、87°F）for about an hour or double in bulk. in the center, and the hall you have just made stays as it is, it’s properly fermented. If the hall shrinks, you need more time like 10 to 20 minutes. 5. Take out the dough onto your working surface. Weigh the dough to make even size bread rolls. Cut out the center to shape into a log. Divide into 12 pieces. In this way, you can easily divide the dough evenly. Shape the each dough into a ball and cover with plastic to avoid drying out. Here comes a fun part! Let’s shape into a roll! Take one dough, dust lightly with flour. Stretch into a disc, Fold from upside and the other side. And then fold in half, pinch to seal, and it makes a log. Roll into a long teardrop. Roll it out with your right hand pushing down the dough. The other hand should be just touching the dough. There you have long teardrop shaped dough. Place the dough the seam side up, Roll it out into a quarter thick. Start rolling from the wide side, tacking a little bit, and streches the dough like this. Pinch to seal and there you have roll pan! How adorable it is! Place them onto baking tray, leave it at a warm place for the final proofing, covering with a damp towel. Do the same as roll pan to shape into a log. Stretch the dough to 10 inches long. If it’s not easy to stretch, leave it for 5 minutes to release the gluten. Tie a loose knot, then take one end to the other side into the hall, pinch to seal to one another. Flip and shape nicely. Place them onto the baking tray at the warm spot. 6. Pass the rest of the egg through a sieve to make the egg wash.
7. After about 40 to 45 minutes, the dough should be double in volume and smells wonderful. Brush the egg wash thinly. You need a little bit of patience, and the effort will come out great. Do not brush too much of the egg wash for beautiful finish. It is optional but sprinkling some sesame seeds add crunchy texture and a nice twist for the knotted flower shape. 8. Bake at 200 ℃ (390°F) for 12 to 15 minutes or until golden brown. Rotate the pan about a half way through. There you have Japanese Roll Pan! Look at that plumpy cute little bread roll! Smells wonderful in ny kitchen! To check the bread rolls are properly baked or not, take a look at the browning part of the surface facing to the baking tray. It should be smaller than the bread itself. These looks perfect! Let’s take a look at inside. Roll Pan shape has more volume and fluffy on the inside. Knotted flower has narrower volume capacity, so the texture is more chewy compare to roll pan. Today, I made sandwiches with leftover Cha-shaw. How does it look? Give it a try and let me know how you like it!